Komodo Archipelago lies in the Lesser Sunda Islands. This chain starts in Bali and ends in Tanimbar. Komodo National Park, located within the Coral Triangle, is a UNESCO World Heritage Site, Man and Biosphere Reserve and one of the New 7 Wonders of Nature. It is part of a biogeographic region known as Wallacea, which contains very distinctive fauna representing a mix of Asian and Australasian species such as endemic Komodo dragon - the largest living lizard, the crab-eating macaque, orange-footed scrub fowl and bird. 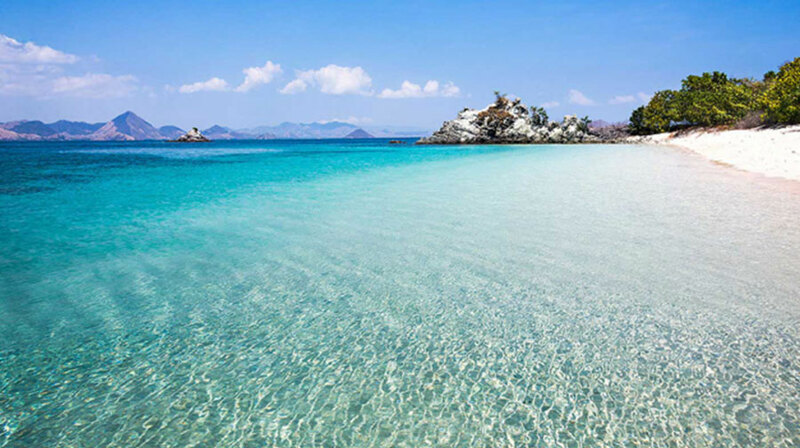 Its brilliant pink beaches and the blue waters are home to over 60 dive sites: 1,000 species of fish, 260 species of coral reef, 70 species of sponge, 10 species of dolphin, 5 species of sea turtle, 14 species of whale, including notable dugong, shark, and manta ray. Our Guests, Evana Tan family arrived in the morning to Sequoia Yacht to spend their family summer holiday in Komodo. This sweet happy family love to explore remote Indonesia such as Sumba, Belitung, and this time is Komodo Archipelago. This is their time to sail in Indonesia, and we were very happy to serve them onboard. We started to sail after the port authority issued the port clearance. We sailed for 18 nautical miles to our first destination, Gili Lawa Darat Island. The sun was shining and the fresh air welcomed us to this very special archipelago. The weather could not have been more perfect. During arrival, the parents spent all afternoon in the golden sand beaches while their 2 wonderful kids spent their time observing a beautiful underwater life through their masks. Sunset time approached, so we took Boston Whaler to the other side of the island so we were able to witness its majestic beauty. 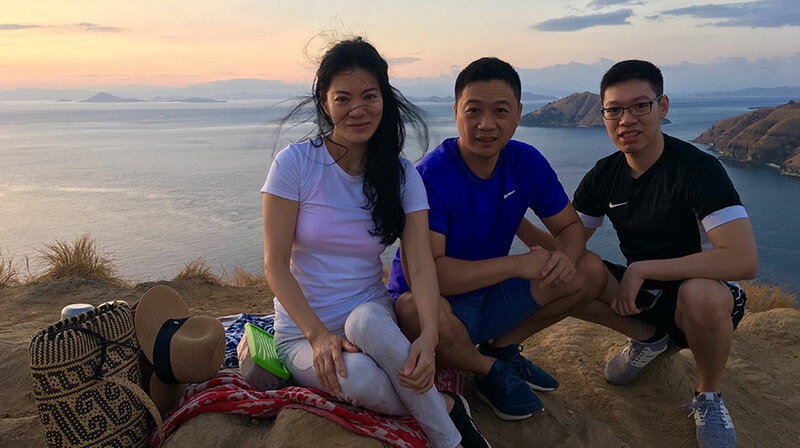 Romantic dinner was served on our sky deck, the delicious dinner and fresh breeze of Komodo National Park made our guests sleepy and went to bed early and getting ready for an early morning sunrise hike at 5 am. The strenuous 45 minutes hiked up was paid off where the early morning sun kissed our checks, as our surrounding hills turned into shade of golden colors. The reward for the strenuous climb is a breathtaking 360-degree view of two Islands of Lawa Laut and Lawa Darat and their beautiful bays. The birds were seen on distance welcoming their morning and ready to hunt the fish on the blue waters of Lawa Darat Island. 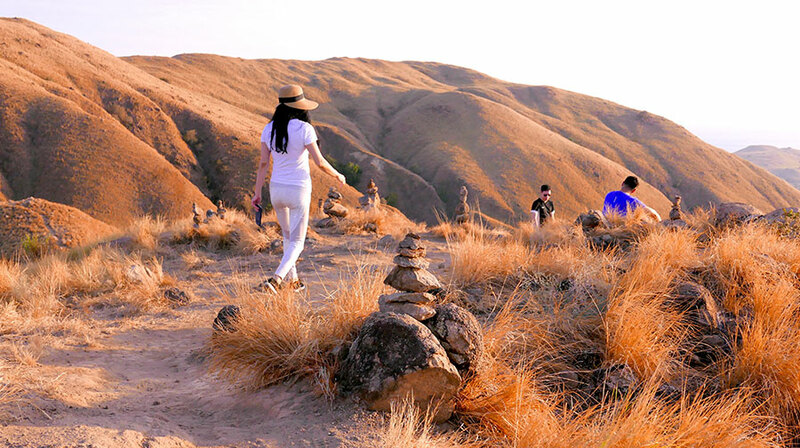 Walking down the hill was the best part, as we followed the quite paths of the islands, we met a beautiful deer, which makes this island its home, wild and free from Komodo dragons. Big breakfast was ready onboard to welcome our guests on their arrival after a beautiful morning hike. Sequoia sailed to the next destination, Taka Makassar. Taka in the Bugis/South Celebes language means reef while Makassar is the originating city of Orang Laut "Bajau People" who settled in the Komodo Archipelago. This site satisfied the sense of adventure. As we immersed ourselves in the shallower depths, we saw schools of fusilier, hump head parrotfish, giant trevally, giant moral eel, colorful reef fishes dancing among corals following the current. The Manta ray is the highlight of this snorkeling and dive site. It is the largest of all the rays. Unfortunately, the manta rays were not seen that day. We decided to take a beach picnic on the Mawan Island and spending time on kayaking and paddle boarding surrounded by crystal clear turquoise waters all to ourselves. As the two kids were curious to Manta Ray, we decided to sail 24 nautical miles further to Gili Banta. Our searched started in Batu Moncho, which also did not see any sight of Manta as we snorkeled. 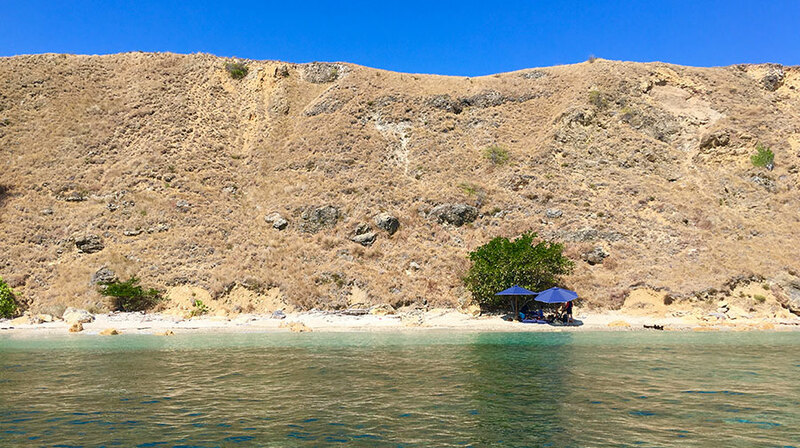 Banta Island is a submerged volcano in the midway point between the west, Sumbawa Besar Island and the east, Flores Island. The cold water from Flores basin is forced through this channel makes it an ideal place for pelagic or "big fish" sightings. 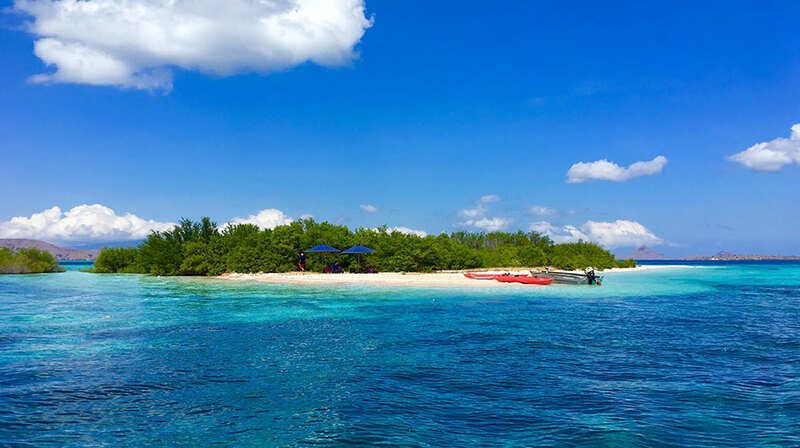 Dramatic rugged hillsides of dry savanna surrounded by beaches and clear turquoise waters are perfect location for on-the water sport adventures like kayaking, tubing and water-skiing. 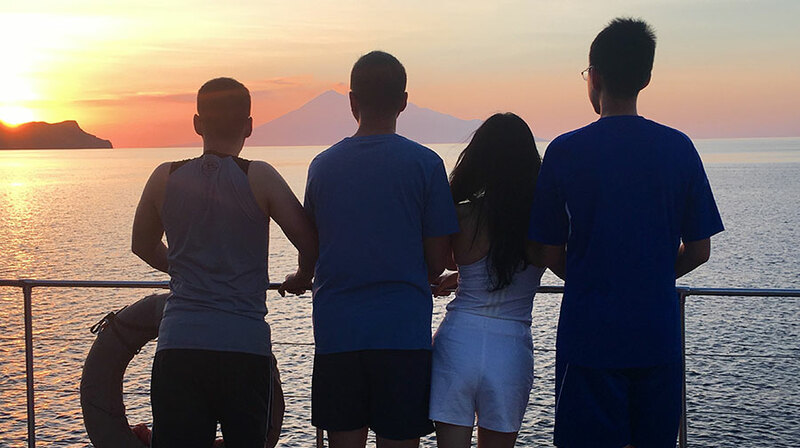 Our afternoon was be dominated by the spectacular sunset view of a smoking Sangeang volcano against a backdrop of puffy pink buttermilk clouds. After sunset, we anchored at the Gili Banta Island where we stayed for the night. 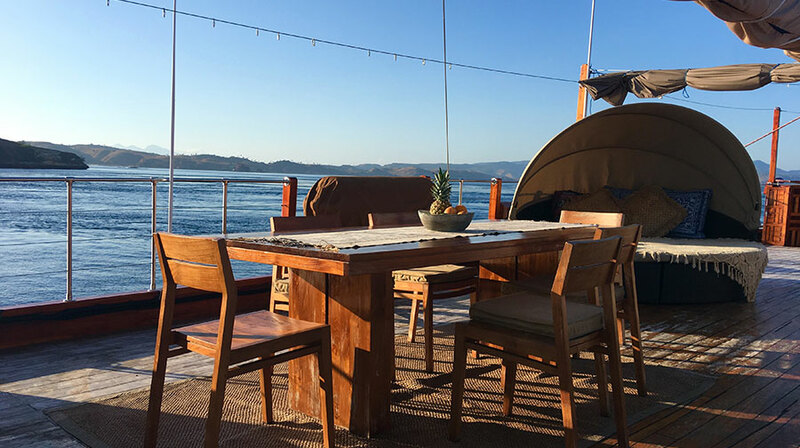 The blue skies of Banta Island set the romantic dinner family setting. Before going to bed, we heard splashing in the transom of Sequoia, and we found millions of batfish attrached to our spot lights, which also invited a pair Manta Rays and a pair of Spotted Eagle Rays to hunt baitfish as their prey. Manta Rays have the largest brain to body ratio of any shark or ray. That may explain why they are curious about human. Rather than objecting to your presence, they often come to investigate you. Being so close to their huge wings will be a memorable moment for us to cherish forever. Our morning plan for a water sport was canceled due to rainy and windy morning. The captain decided to sail 18 nautical miles to Gili Lawa Laut for a calm sea and snorkeling. Upon our arrival, we set up a beach picnic on the beautiful little beach and snorkeling in the reefs nearby. It was so full of life and beautiful. 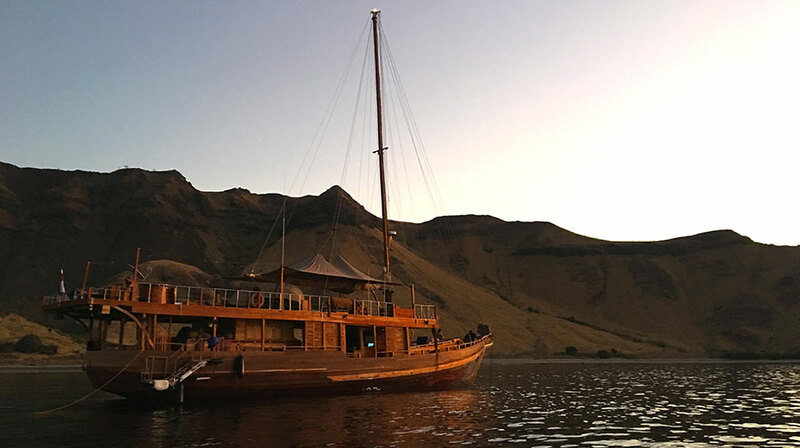 Lunch was served onboard and we sailed again for the afternoon sunset hiked on Padar Island. There was a construction happening on Padar Island, which made the place not as pretty as before. We spent the night on sky deck for a romantic candlelight dinner. 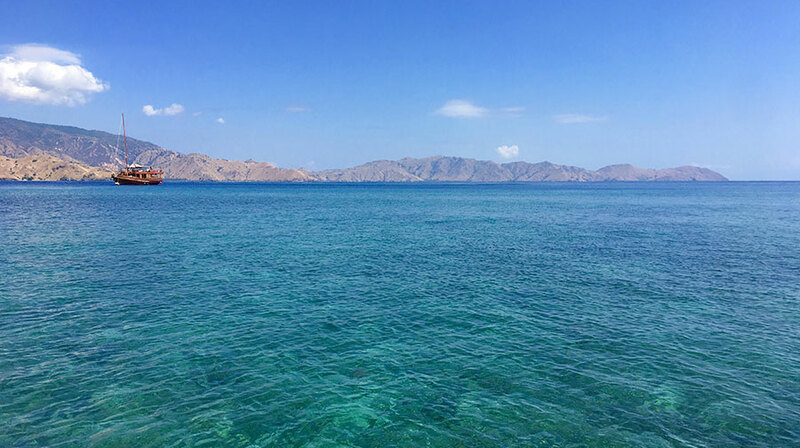 Rinca, Padar and Komodo Island are the three main islands of Komodo National Park and all three have native Komodo dragons. 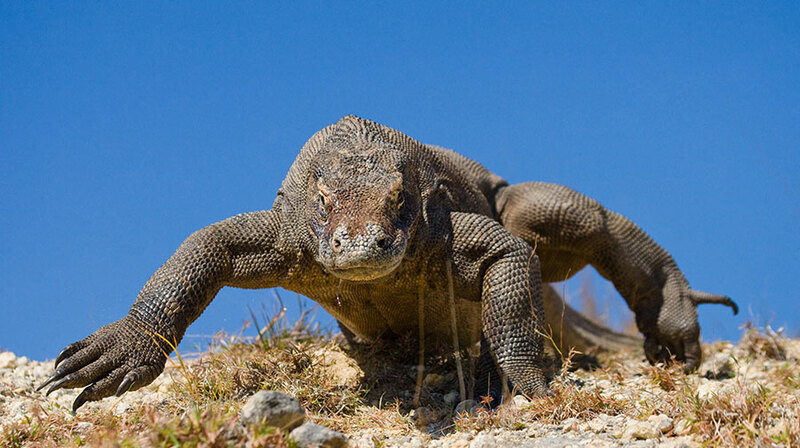 A total of 5,700 Komodo dragons make this national park home. 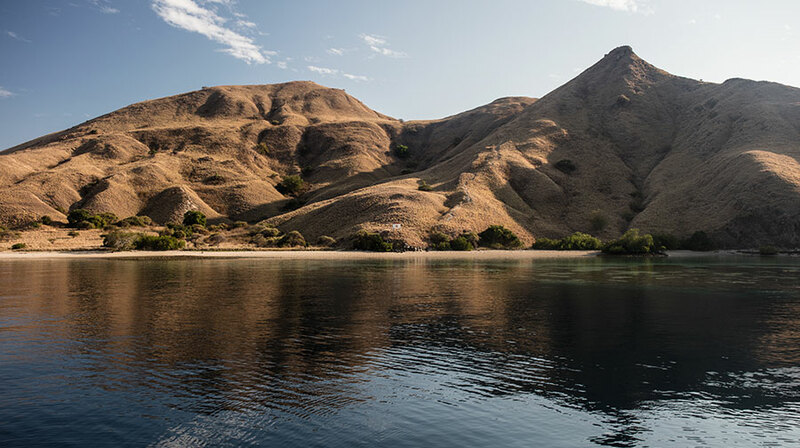 Rinca Island is not as well known or visited as Komodo Island, but it is more wild and remote which makes it special for our guests to explore. To ensure your safety, Rinca Island trek was led by one of the Park Rangers who is familiar with the dragons. This is an experience that few will ever forget. In 1912, The Dutchman, Peter A. Ouwens was the first person to describe the Komodo dragon, Varanus Komodoensis, in a modern science journal. 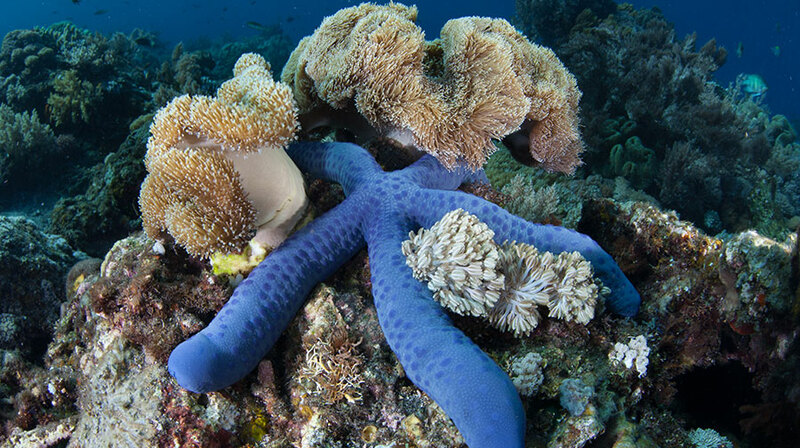 For the next 60 years after its discovery to the modern world, little was known about this unique species. In 1970s, an American scientist, Walter Auffenberg together with a young Indonesian scholar, Putra Sastrawan, moved to the isolated Komodo Island to do a scientific study. His study was published in his famous book "The Behavioral Ecology of the Komodo Monitor" in 1981. Today, the Komodo dragon is one of the famous animals in the world. 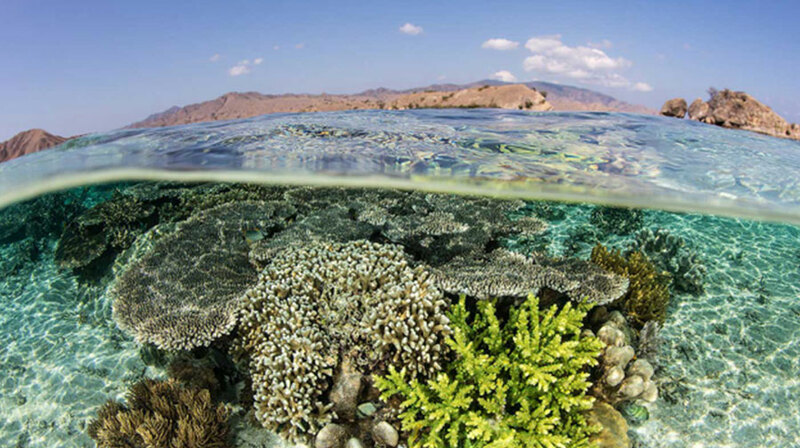 Komodo is an island of stark contrasts. The west skyline is dominated by Ara Mountain, while the ancient volcanic cones of Ntodo Klea stand out in the east. In between the dark green highland lies the wild Lontar palm trees and Zizipus savanna of Loh Liang and Loh Kalo. Under its blue waters, the convergence of warm and cold currents breeds nutritious thermal climes, rip tides and whirlpools that attract large schools of pelagic, from dolphins and sharks to manta rays and blue whales. It is believed that "Orah", the Komodo dragon, was born in the Komodo Village, which is a small fishing village on the island. Around noon, we passed this island in our way heading to Labuan Bajo. At the end of our sojourn, our crew spent their time with guests and looking forward to serve them again in Raja Ampat. © 2017-2019 Coral Triangle Safaris. All Right Reserved.